Starting out on your eLearning journey without defining the information or skills that you want your learners to obtain by the end is like setting out on a road trip without a destination. While this might make for a neat setup for an indie film about four friends trying to find themselves, this really doesn’t work for eLearning. So, what is a learning objective? It is an expected outcome of each lesson/unit and, overall, what you want your learners to be capable of by the end of the it. They also break down the content into more manageable chunks that can be applied to modules within the overall course. Start by picking 3-4 objectives. Now make sure your content doesn’t wander too far away from these objectives. However, a bunch of phrases that are put together and doesn’t explicitly relate what the learners should be able to achieve at the end of the course is of no use. 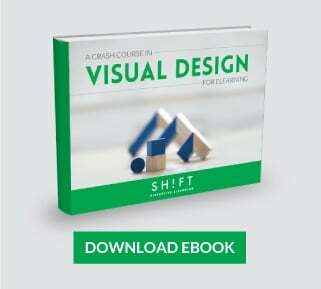 Objectives need to be written in a way that the learners can relate to their need for taking the training and visualize the result or the learning outcome. Before writing course objectives, you always have to think from the learner’s perspective. You should step into their shoes to understand their needs and aspirations. Also, consider the demands of their jobs, so you know exactly what skills they need to excel in their professional duties. 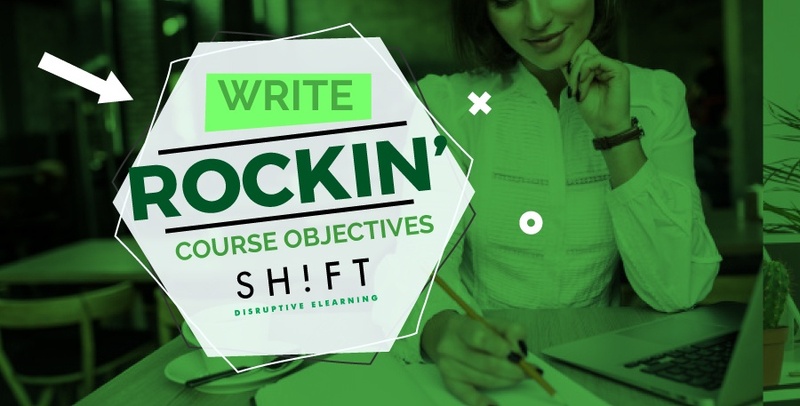 Being an integral part of the eLearning development process, you can't deny the importance of knowing how to write rockin' course objectives. What would the audience be able to achieve after taking this course is what we are talking about here. Strong and well-written objectives describe outcomes, not activities or tasks. They focus on the terminal behavior and not the subject matter. Instead of describing the course content in the objectives, they state what learners should DO. A well-written objective should associate a single goal or outcome to a single task or skill. For instance, it should avoid having a combination of two actions using ‘and’. A single goal per objective proves to be better when measuring the performance of the learner. The whole purpose of writing learning objectives is to make your course more focused and the goal simple enough to be achieved. Use words that allow you to actually measure results, words that will help you measure if the student understood the content. Try using actions verbs like "Identify a valid explanation of...." or “Specify the factors of…” or “Define the following concepts”. It’s easier to write the evaluative question for an exam that way. The most preferred verbs of instructional designers include: define, identify, demonstrate, compare, outline, create, select, which one could easily imagine while the other is performing. Using vague terms like ‘understand’, ‘comprehend’, ‘appreciate’, or ‘learn’ is not recommended as they do not appropriately help in describing the behavior that is expected of the learners. Since it is not possible for us to get into the brain of the learner, it is always better if you use words that can be quantitatively assessed and directly point to a change in the learner’s cognitive ability. If you write broadly worded objectives chances are that they cannot be appropriately measured. 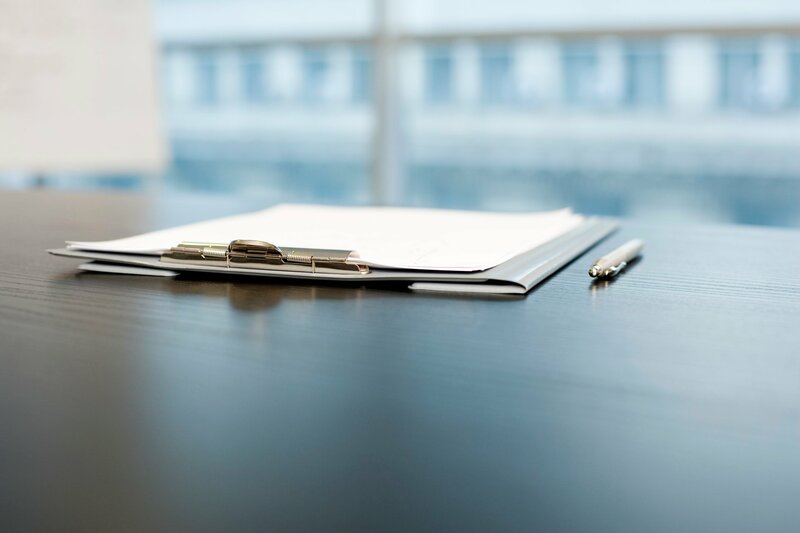 While writing objectives, make sure they are as precisely worded as possible. They need to be focused on the more immediate effects post taking this course. The more specific the objectives are, it will be easier for the readers to grasp the content better and digest it. Go here: Learning objectives word bank. The learning objectives should solely focus on the learner and not the trainer. Learning outcomes are all about what the students can demonstrate while taking the course and not what the instructors can provide. A clearly defined objective would always specify what kind of behavior, understanding or performance is expected of the learner. Bad: Explain the benefits of yoga for an elderly person. Good: Determine the most effective yoga exercisesan for an elderly person. 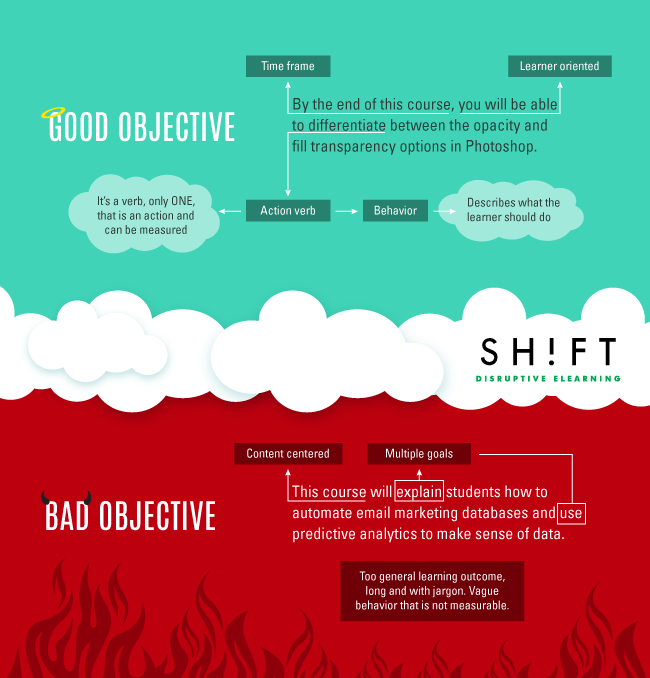 You should always keep in mind that your learners are taking this course for a reason. Hence it is very important to speak with them directly and address their needs.You can, of course, do this by simplifying complicated concepts and throwing real life situations that the learners can relate to. And to start with this, you should always keep the objectives (read the end goals or learning outcomes) simple and unambiguous. Also, use words that would be encountered in the learning. Reserve the jargon for other times; instead, speak in their language! For example, an objective such as “Appreciate the usefulness of the circuit” is quite vague. But if the same objective could be put as “Describe the four benefits of a circuit”, we are actually conveying the usefulness of the circuit to the learners in a way that could be measured. Take the usual bullet list and add a complementary visual for each of the points. Tell a story. Instead of thinking in terms of Bloom's verbs imagine you want to tell the story of a hero who has overcome seemingly impossible challenges. Use questions instead of the typical learning objective form. Use scenarios that place the learning objectives in perspective. Michael Allen suggests some other alternatives to listing out boring learning objectives in text bullet form.